It was designed in 1947 by Italian Giordano Robbiati, it stayed in production (not changing a great deal) until 1986 when the factory burnt down. It’s been re-badged by various importers round the world, such as: Stella (Austria), Qualitat (Hungary), Robbiati (Italy), A&MG Sassoon (UK), Bon Trading (Australia), La Sorrentina and Thomas Cara. There’s a blog dedicated to nothing but the Atomic – Worlds Best Loved Coffee Machine. Or you can buy a whole book about the Atomic – Enduring Design. Maybe you fancy getting a secondhand Atomic, then check out the eBay buying guide. And if that’s not enough, you can get all you will ever want to know about the history, care & maintenance, restoring and making coffee with one from this Atomic Site from New Zealand. Recently the Atomic has been resurrected as the La Sorrentina Coffee Machine by an Australian entrepreneur (Ikon exports?) who has begun manufacturing a premium reproduction of the Atomic which is a best seller in Oz. For us Limeys the brand new models are being imported to the UK exclusively by Atomic Coffee House, you can buy one from their site for £279. Jan 21	This entry was posted in Industrial Design, Stuff to Buy by cookie. Bookmark the permalink. Just bought an atomic stove top coffee maker today which was from the estate of an actress called dana wynter from the fiftys. Didnt know if it would work but cleaned it out and just drinking the best coffee while i write this post. Great machine and even better that there is some history attached to it. I bought an ATOMIC Sassoon London model in the mid 90’s at a local flea market for 3 euro! It’s missing a jug. If I knew what it was, the dealer would probably have the jug somewhere in a box. I have bought a new jug from Bon Trading but I am on a mission to find the original jug which have different handle design. Does anyone know where I can find the proper jug? I have no luck finding one on the net. Hi Guys, Dave here from JCS. We restore vintage espresso machines from Atomic to Faema vintage, gaggia,the whole shabang of stuff from the golden era of milan. Some machines are made better than others,for example India made an Atomic and it was just dreadful, yet because of its limited numbers it also has started to become collectible..go figure?? wow- great spam post luke caldwell- nice slander of what is a good machine that no doubt you know nothing about. For a paid (?) bon trading spammer your text is very poorly written and sounds disingenuous, fake and insincere. Nice job. Ive got an Atomic which was bought in 1951 on the kings road. The black valve has jammed (corrosion?) any ideas where I can get it repaired?? It made amazing coffee…..
I’m not sure where you get your information from, but you can buy a real Atomic Coffee Machine from Bon Trading in Sydney and I know they will ship world wide. The La Sorrentina you mentioned is a poorly made fake – the real one is much better quality and will last for years. I’ve just seen a new site they’ve put up that will take orders- definitely should be checked out. We just got back from NYC and my husband was going to walk to our nearby bakery for a cappuccino and I said, “No wait!”. I brought it out of storage today and made my husband a perfect cup of foamy fabulousness. He is very happy with me right now. “This is the real deal, baby!” That is what he just said to me! P.S. I have learned that if the pipe for steam gets clogged, just use a pin to clear it out. Also, I live in an area of very hard water and once in a while I clean it out with a soloution of vinegar and water. how can I get one living in CA? i never heard about Atomic Coffee Maker. but i see that the look of it is very nice in its beautiful curved lines and rugged mechanical utility. Years ago in my student days I used to live with someone in Australia who had one of the original Atomic makers and it made the best coffee. I hunted and hunted for one to no avail but nice to see they have re-released these. Hopefully the milk frothier works better than his. 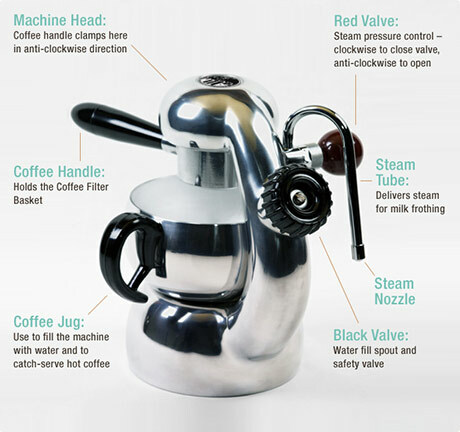 Pingback: DesignApplause | Atomic coffee maker. 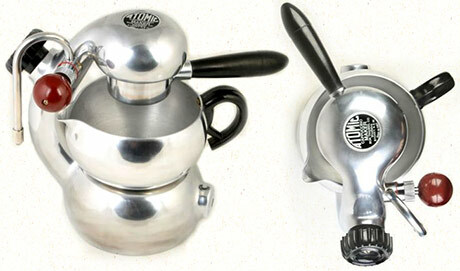 wow, never realised they made stove-top coffee makers that look that nice. i’ve got one of those cheap hexagonal ones that i love but one of these is definitely worth saving up for. thanks for the tip. One comment with three smileys!